Jack Mason has grown up as an acrobat in a circus. Now, after the tragic death of his parents, he must live inside the gloomy walls of Sunnyside Orphanage in London, a city of fog and snow, filled with airships, steam cars and metrotowers that stretch into space. Luckily for Jack, he’s taken under the wing of the brilliant and eccentric detective Ignatius Doyle. Little does he know how dangerous life is about to become. A girl named Scarlet Bell comes seeking the great detective’s help. Her father has been kidnapped, and the future of the world itself may be at stake. Is the evil hand of Professor M pulling all the strings? Mr Doyle and Jack know there is no time to lose. Fourteen year old Jack Mason can't remember a day when he wasn't the target at the Sunnydale Orphanage. But Jack is about to have the adventure of a lifetime, bringing hope to Jack's life, something he hasn't experienced since his patents died. Before life at the Orphanage, Jack was an acrobat, his parents forming a team of trapeze artists known as The Flying Sparrows and were tragically killed performing a stunt. But nothing could prepare Jack for the eccentric and flamboyant Ignatius Doyle, Consulting Detective. When the police have an unsolved case, they turn to Mister Doyle. Using the powers of observation and deduction, the quirky middle aged detective has now found an assistant, the nimble and highly observant Jack. In the lustrous world powered by steam, the new duo's first case arrives in the form of miss Scarlett Bell. Scarlett's father had disappeared, and what sounds like a simple missing persons case, has become a web of intricate secret societies, lies, inventors, monster men and Nazis. 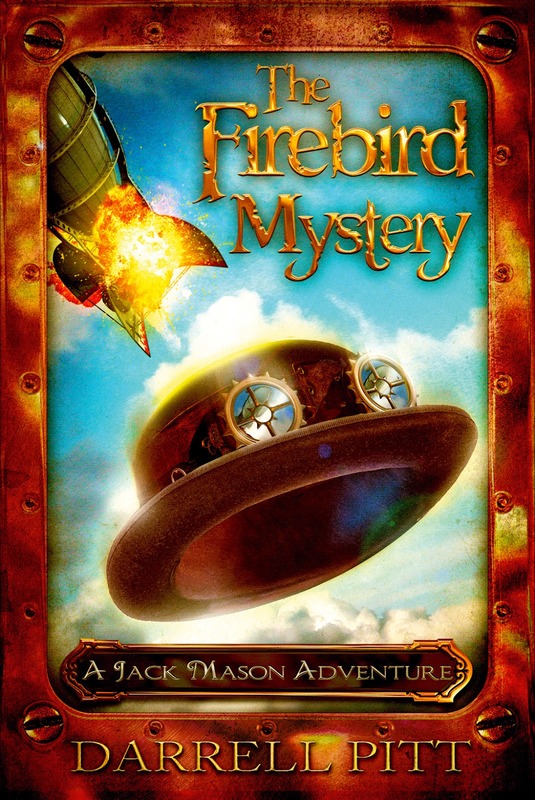 The Firebird Mystery was charming, witty and intelligently written. I haven't read many steampunk novels, but this middle grade addition to the genre was incredibly enchanting and entertaining. The book follows orphan Jack, plucked from a questionable children's home and thrown into the world of crime solving. Mister Doyle has faith in Jack's abilities and provides the emotional stability that Jack desperately needs. But Mister Doyle is the clear star of The Firebird Mystery, his constant testing of Jack's observational skills is hilarious. Nailing a piece of toast above a door, putting together a spy kit with a nose disguise, to storing cheese in his pocket for random snacking. Although he's described as being well past middle aged, his character reminded me of a quirky Johnny Depp type character. Fabulously eccentric. Scarlett isn't without her fans. In a time of modest women, she's a trailblazer for teen girls. She's feisty and can hold her own, despite Jack's need to protect her. This series no doubt will be a huge hit for early teens, the writing is intelligent and Darrell Pit has created characters that challenge and provoke readers to invest in the storyline. This sounds like such a great book for kids, a lot of fun and with a great cast of characters! It's perfect for preteens and even early teens. I like how it doesn't dumb down the story for kids, and I think they'll really appreciate the uniqueness of a steampunk middle grade novel, especially boys. I haven't really been interested in this when when I received it for review but looks like a lot of fun. The star of the book is definitely Mr Doyle, he was utterly brilliant. I love a quirky off beat character. Thanks for stopping by Melanie. Sounds like another great middle grade read, lovely review Kelly! Definitely an eccentric character and Scarlett sounds like a good idol to have too. I can imagine this one will end up popular with the early teens into something a little different. No complicated romances, no excessive drama, just good clean fun. I think it's set to be a six book series, but don't quote me on that. I haven't read too many either Amy, I think the most notable was The Masque of the Red Death. This one is just fun a quirky, a great one to launch into the genre too. Any quirky older characters tend to remind me of Johnny Depp, he's like my go to guy for all things weird and wonderful. There's nothing that man can't do. I don't either Zoe, but this one is just a fun adventure that I think will appeal to all ages. I still need to read this...Mime read and reviewed it for me so I kind of didn't bother (my bad). It kiiiind of intrigues me, especially the eccentric and quirky characters, but it didn't float Mime's boat particularly. *sigh* What conflicting life choices I have to make. Does Mime generally enjoy the books you've liked too? It's defiantly one aimed at the kiddies, but if you enjoy a light adventure that's just clean fun, you'll probably enjoy this one too.